As is the nature of the beast, the small size of the conference and the bowl assignments assures the Big East draws crappy opponents year after year. So all they have is their BCS opponent, and for the second straight year they acquitted themselves very well. Most impressive win: West Virginia beating Oklahoma was by far the most impressive win in the BCS. Even the Buckeyes had a pulse late in the 4th quarter–Oklahoma was down quickly and out early. Most embarrassing loss: South Florida. What the hell happened to schools from Florida? The state of football went 0-4 in bowls, and Miami didn’t even make it. Other games: Rutgers obliterated Ball St. in some game in Canada. Yeah, huh? Cincinnati beat Southern Miss, who had just learned their coach was getting the pink slip. These weren’t exactly the powers of the world. Shame for the Big East–all the mettle they had put up in the regular season could not be put to the test. Toughness: None really. Other than Oklahoma, two wins came to the minor conferences and the other two losses came to the big. Last among the big conferences. Most impressive win: USC beating Illinois was expected, so I’m going with Oregon hammering a pretty good South Florida team. Any thoughts that the Pac-10 and the Big East are on equal footing talent-wise were mightily shaken with the fourth string QB for the Ducks just passing at will on the Bulls. Most disgusting loss: I have to say, I hated watching that Arizona State team play. Their first quarter stats are astoundingly bad–they scored FOUR touchdowns all season in the opening stanza. The Holiday Bowl was, for the second time in four years, an embarrassment for the Pac-10 as a BCS contender got romped. Texas should have won by 40 if not for this bizarre play. Other game notes: UCLA had every chance to win that BYU game and squandered it (I would know, I liveblogged that ridiculous bowl). Oregon State utilized their horse Yvenson Bernard (who I think can make some significant noise in the NFL) to move past Maryland, and well, we know about Cal. All in all, the bowl performances didn’t show much, but like I said before, the metrics are fairly different from the regular season because of the way the seedings work out. It’s naturally more difficult for a Pac-10 team to manage two teams into the BCS because of its brutal round-robin, and it’s difficult for the Pac-10 to prove anything with their lousy tie-ins. Toughness of opponents: 4th–not one top ten team, and they did not fare too well against top twenty teams. Still, four ranked opponents out of six is a fairly strong aggregate. Grade: B (fairly run-of-the mill year for the Pac-10, albeit far more impressive than last year’s performance). Most impressive win: Geaux Tigers! Most embarrassing loss: Oh, Florida. Those who mocked the Big 10 in earnest all offseason get taken apart by the black sheep Wolverines. The punishment seemed fitting. I considered Arkansas for their no-show performance, but their player-popular coach just did get fired. Toughness of schedule: 3rd. Now you might say second because there were five ranked teams, which is impressive because the SEC was 4-1 versus ranked opponents. However, two of those teams were from the Big Ten, a conference that did little to prove its worth during the regular season, one was from the ACC (a step distinctly below the SEC this year), and one was Hawaii. Although these teams were ranked, the competition was much lower than in the Big Ten or Big 12’s schedules. For all the talk of South and West being the best conference, the Big 12 continues to perform superbly in bowl season. Between its record in the offseason and its record in the postseason, the conference of the heartland held its own very well against every major conference save the Big East. Most impressive win: Kansas did their best to rescue the Big 12 from Oklahoma’s massive dump the night before by knocking around Virginia Tech. Most embarrassing loss: Bob Stoops, despite the best efforts of his brother Mike, cannot justify yet another BCS appearance and subsequent loss (Oklahoma is now 0-4 in its last 4 BCS appearances and has been outscored 167-103 in those appearances). Toughness: 2nd. And it’s a strong second too; five top-25 teams and a 4-1 record. 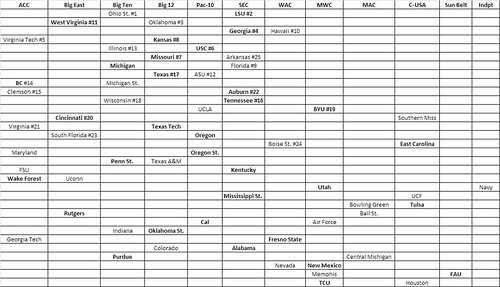 Again, the Big 12 delivered by handing each major conference outside of the Big East (Big 12, Pac-10, SEC, ACC) a loss. While the Big East and the SEC can lay claim to either the regular season or postseason crowns respectively, the Big 12 seems to have a major edge by being near the top in each category. In the future I’ll tackle the biggest matchups of the year and see how each conference fared, and we’ll see who performs the best there. Again, having the most impressive accomplishments on your resume doesn’t make this team the best, it just means they’ve shown what they’re capable of on the field rather than through the mystical intangible of talent and potential off the field. This is the important distinction to make. To view the spreadsheet with the data, click here and examine Sheet 2.